Hamby Home(in)stead ...: 200 Eggs! Barely a fortnight after their arrival at Hamby Home(in)stead, our chookies laid two extreme eggs. They have since gone on to gift many 70-75 gram eggs but excelled themselves this week - on three counts. 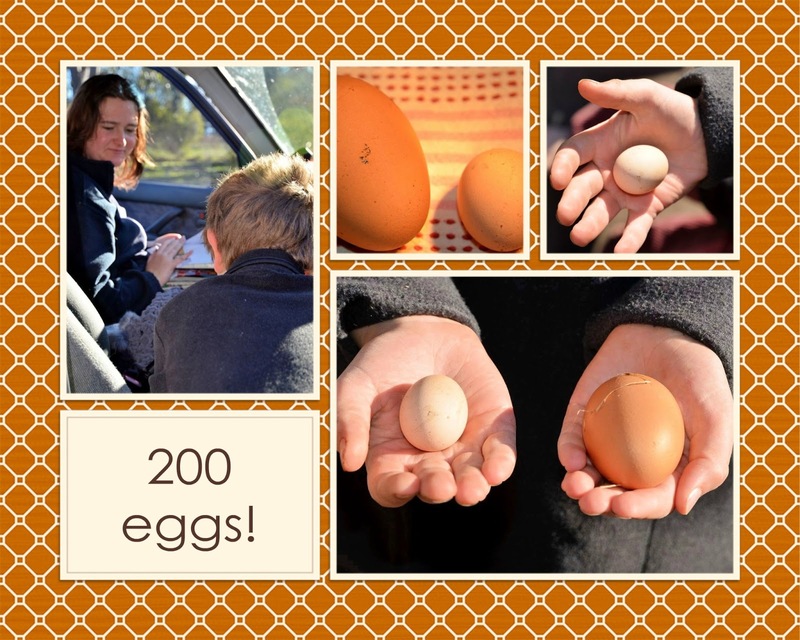 Yesterday marked the occasion of their 200th egg! It was also the day we received their first-ever 80 gram effort (definitely a record for the girls) and then today, possibly worn-out from yesterday's exertions, Vaughan collected the smallest egg we'd ever seen. Today's mini-egg weighs somewhere between 15 and 20 grams, so is significantly smaller than their previous smallest which was just 30 grams! The girls laid their 100th egg back at the beginning of May. At that stage we were receiving around 14 eggs a week, which was slightly less than what we had been given soon after their arrival. The weekly egg tallies dropped further, getting as low as 5 eggs only a few weeks back. We've been expecting the girls to cease laying, particularly as there have been a couple of days when the nests were empty. They surprised us last week though, giving us three eggs on three days and scoring 16 eggs in total for the week!